I am blessed in so many ways. My family is truly an amazing gift. My wife Angie, is incredible and has put up with me for almost ten years now. She finds joy in the things I tend to overlook, and helps my children to celebrate life. What an incredible, and enjoyable home she creates for us, and it isn't about the great food or cool decor, it is her that makes it home. My son Brayde n is truly a kind hearted, and compassionate soul. Sure, he is all boy complete with moments that he gets irritated with his twin sisters, but he is amazing in his consideration of others. I am convinced that the degree to which he possesses that compassion is an imprint of his Maker. He is destined for greatness. I can't wait to see the script of his life play out. My twin girls Josie and Maddie are constant reminders of God's ability and choice at times to suspend the nor m and do miracles. According to all the experts they (my girls) shouldn't be here, or at the very least shouldn't posses the perfect physical health that they enjoy. They are beautiful and very much "individuals". They are miracles. My Savior Jesus Christ, for some reason allowed me to be born into a home with parents that loved and honored Jesus. I have been surrounded by great men and women that made pursuing Jesus with the totality of my life simply irresistible. Why wouldn't I pursue a relationship with the ONE that made these incredible people tick and live as they do? I want help as many people as possible to experience the revolutionary love of Jesus. I am so grateful to know Jesus personally. My parents are some of the most generous people I have ever known. Always giving, yet never wealthy by the world's standards. For me being taught about Jesus would have never been enough, but in them I experienced the transformational, even transcendent life that this "God-man" Jesus provides. They were different and it was obvious. They had peace in the midst of chaos, stability in crisis, fairness when it wasn't earned by my brothers and I, and character in a world that bends frequently. My brothers both love and serve Jesus with passion as I do, though we are all in very different walks of life. I am convinved that much of this is directly related to the environment we experienced as children. Ridge Church is a dream both in formation and realization and I am so thankful for her. Over Thankgiving break our family went horse back riding and the horse Josie and I were on was oddly pre-occupied with cleanliness. She avoided every mud puddle and...well, you can figure out what else she avoided! So while all the other horses marched in an orderly line. Our horse walked by herself in the field, and sometimes in the woods on paths that weren't really paths at all. She was a pioneer of sorts. Blazing the trail, as tree limbs slapped me in the face, and briars grabbed my pant legs. There is a lesson in that---Being the pioneer isn't always as glamorous as it seems! I suppose it was fitting that I would be on the horse that wouldn't "walk in line" t hough since I am the same way. Conformity is not my greatest attribute. Something inside of me says, "yes, I can when someone tells me that I can't." I have been this way since I was little, and it is even more true of me as an adult. Here is a snap shot of my horse "out of line"...where she was the entire ride! All this to say, that I am thankful for Ridge Church, not because we are simply different to be different or because we are walking "out of line" from rebellion, but instead because we have been willing as a group to challenge the process and do what was necessary to communicate to those we love, the truth about God in a way they can understand and relate to. Sometimes that requires "getting out of line" and thinking in new and fresh ways. I am grateful to be associated with a group of people that are willing to take this risk and join us in this adventure. "The question is not whether we will be extremist, but what kind of extremist we will be. Will we be extremist for hate or extremists for love?" -Martin Luther King Jr. 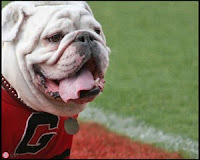 Yes, I'm a DAWG fan. Yes, I'm a pastor in Charlotte, N.C. but I am also a huge Georgia fan. I don't know how you picked your team...maybe you liked their uniform, or maybe your home team kept loosing so you picked another team, or maybe you gave in to the pressures of your spouse or in-laws (wimp! ), or maybe you cheer for your Alma-Ata, or maybe you hate sports (I'll pray for you)...but for me it was and is simple. I grew up in Athens, just a few minutes from the University of Georgia. When I lived there the city was roughly 100,000 with a football stadium that "now" holds 92,000. Without seeing or experiencing, it is difficult to comprehend the dynamic of a city that size with a football stadium that size. The whole city goes nuts on game day, and it's literally contagious. I don't know how you could live in the city for awhile and not walk away as a die hard Georgia fan. I rearrange my Saturday's according to the game. Truth be told I hope that people in Charlotte will have that same kind of response to Ridge Church. I want them to experience such affection, enjoyment, excitement, acceptance that rearranging a schedule in order to be at church seems normal. We have set our sites on being an Irresistible Church and we are well on our way. Thanks to all of you that are a part of what God is using Ridge Church to create and do. Keep inviting people, and keeping working hard with us to create environments that reflect our Heavenly Father. Remember that everything we do as a church, reflects something that we believe about God. If you happen to live in or near Athens, be sure to check out Athens Church. I had the privilege of spending a few days in Rome, Georgia this week with the lead pastors from our partner churches. For reference, Ridge Church is a partner church of North Point Community Church, lead by Pastor Andy Stanley. Ridge Church is an autonomous local church that shares the same values, mission as North Point. There is an incredible growing network of churches around the country in partnership with North Point. What an incredible group of people! It is a unique combination of talents, experience and humility that makes this group of leaders such a great group with which to be associated. People often ask me about our partnership to North Point. Click HERE for more information and map of partner churches. Also we are really excited about our newest partner church, Auburn Church which will be opening their doors to the public in January of '08. We are praying for them and are excited to see how God will use them to make a difference in their city. People frequently ask me, "How is your church doing?" I've noticed that often times what they are really asking is "How many people are coming but they don't usually come out and ask that bluntly?" It's not a wrong question or even a bad question, but it does represent something significant. Whether at home, at work, or even church, we all long to know when we are winning. My staff, our volunteers, the friends of Ridge Church and partner churches across the country all want to know if we are being successful. So how are we doing? The short answer---We are doing great. How do we know? We know because we have identified some of the things that for us are "success". After our last worship gathering, a young man in his early twenties, told me his life was "completely different". By his own admission as a result of his experience at Ridge Church a week ealier when he drew a line in the sand and said he was ready to quit running from Jesus. He said the peace and purpose that he experienced in the days following that decision were "beyond explanation"...for us that is success! It is vitally important that we learn "what things indicate success" and then celebrate those things consistently. We consider it a privilege that God sees fit to use us in "His plan" for this generation, in this city. High Flying Start to the day! So, I'll admit that I'm a bit incoherent first thing in the morning. My roomates in college used to love waking me up just to watch the fall out of random sentences and actions. My brothers (in an act of love I'm sure) stood me in the hallway one night long after I was deep in dream land, just to watch my reaction. This was before the days of google video and youtube thankfully! So this morning, my wife woke me up 30 minutes before my alarm went off with the announcement she had wrecked the car--I was very confused, and probably said a few weird things. (Actual photo of the event above to the right). She turned the corner in the neighborhood and some [I'm sure normally very intellegent gentlemen in a not so intellegent mom ent] had parked his trailor in the road with the ramps down. She hit the ramp...yes, literally hit the ramp. (The result was miraculously captured in the photo to the left.) Fortunately, the airbag did not deploy! Later in the day, when I went down town Charlotte again with my friend Todd Brower. He gives his Wednesday afternoon to feeding homeless men and women lunch as well as encouraging them by sharing truths about God from Scripture. It was really cold, and one of them came in with a baby in a stroller. They stood in a line that bent all the way around the store, waiting for the doors to open. Many of them thanked us over and over for "Pizza and a drink" and a few minutes in the warm. Funny thing...the car isn't as big a deal tonight as it was this morning. A life with volumes of success but little significance isn't much of a life. Who among you are like me in that you find yourself ridden with the constant temptation to jump to the end of the book and read the final chapter instead of enjoying the story as it unfolds? Well, Ridge Church and each of our lives are part of a story that God is writing. A story that I am so grateful to be a part of as I know each of you are. God is continually reminding me to enjoy each page of this story he is writing, so I wanted to give each of you an excerpt from the “current” chapter. Ridge Church has the unique privilege of having friends and supporters in Charlotte as well as multiple other cities and states, and I want you to know and experience what you are part of whether up close or from a distance. I always carry the “privilege” of a burden and deep passion but my heart was burdened and excited in a unique fashion all week leading up to our most recent worship gathering. I had a sense that it would be a defining moment in the life of our church. I had a sense that it would be a moment of spiritual breakthrough for many people individually as well as our church corporately AND, it was just that kind of night! The Result was...well, truthfully it is still unfolding, and I am convinced the intensity of that night will have a ripple effect in the lives of all that were there as well as many who were not. Many tears flowed, courageous decisions were made, and many hearts were set free from running. In next chapter, I am convinced that God will write many stories of redemption, restored marriages, reengaged hope...there will be teenagers that stop running...there will be city “influencers” who’s hearts get in rhythm with the heart of God and begin to leverage their influence for the eternal rather than the temporal...there will be addictions that loose their power in the shadows of the newly found power of God in people’s lives...there will be conversations in the back yards of neighborhoods and office hallways, not about NASCAR, or the Panthers (most recent loss), but about the newly found or renewed purpose as a result of Jesus...there will be a wind of change and hope that begins to stir and replace the mundane and ordinary...church will be prioritized by people, no longer viewed as a place for left over time, energy and resources!! **Call me a dreamer, but I believe that God himself left that fingerprint on my life. But, It’s not just a dream, it is a preferred future worthy of MY LIFE! It can and will be a reality. I leave you with a sneak peak of worship from our last service.